Ask students what the difference is between a health claim and a nutrition claim. Most students don’t know so I have them go to their iPads and look it up. Before they answer, I show them a box of Cheerios and ask them to be able to give me an example of each claim from the label. You could also set up a gallery of food labels and have students come up with several examples of each depending on the products you use. Students then share their findings on both claims as well as reference the actual corresponding examples from the Cheerios box or gallery examples depending on what you used. Ask students why food companies market this way and if products make these claims, can we assume they are automatically healthy and nutritious for us. Discuss their responses. Show students this YouTube Clip “Healthy or Junk Food? Busting Nutrition Labels” to further explore the introductory questions. If pressed for time, you can stop the video after the “Nutella” example. 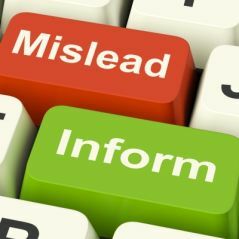 Since there are a lot of claims out there, I have students look up specific examples, summarizing in the own words what they mean as they fill in a chart by utilizing this article/website titled “16 Most Misleading Food Labels. Students use the information from the video and chart to write an informative acrostic poem with the phrase “BEWARE OF CLAIMS”, following the criteria in the guide sheet. Students can apply this knowledge by completing this food product labeling assignment from Nutrition 411. As a creative culminating or extension project, students can “remake” a food product for it’s true meaning like the Nutella example from the video. Students just need to include the original label of the product they are remaking either in picture form or actual container form. 16 Most Misleading Food Labels: Healthy or Just Hype? Image courtesy of Stuart Miles Free Digital Photos. LOVE IT! I needed a new NFL project……….could you send some pics of the acrostic poems Bewared of Claims? Thank you! I added a sample to the attachment section!